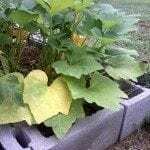 I am growing crookneck, straightneck and zucchini squash. Planted about 3 weeks ago in good topsoil raised garden bed. Plants are about 15-18 inches wide and all are blooming. My problem is all are bearing only male blossoms. What is my problem and how can I correct it? Thank you.